I know most people here don't like this song but I love it...especially this video...I love what she does at 24-25 seconds. GDB2LV, John Adam, Carpe diem and 5 others like this. Actually, I love this song too. It’s interesting how they used a lens that gave it the look of looking into one of those old Christmas bulbs that had the one side look like it had a “belly button”, or even the shape of an eyeball if you were looking at the cornea. That effect was achieved with a spot filter over the lens. I have a vintage one from the 70s. It's a thick convex lens, with a hole cut in the center. Depending on the focal length of the lens it's attached to, and the lighting, the effect can be anything from mild soft-focus around the edges, to dramatic flaring and ghosting, all while keeping the center circle sharp and distortion-free. It's loads of fun to play around with, but not something that I've used very often. I like SSS much better than Jambalaya. with the P/S, as pictured in the resource. I like that cover art for the single. She wore it on the TopPop Music Video above of "Sweet Sweet Smile"
She wore it again in the opening of Space Encounters tv special, singing the same song. 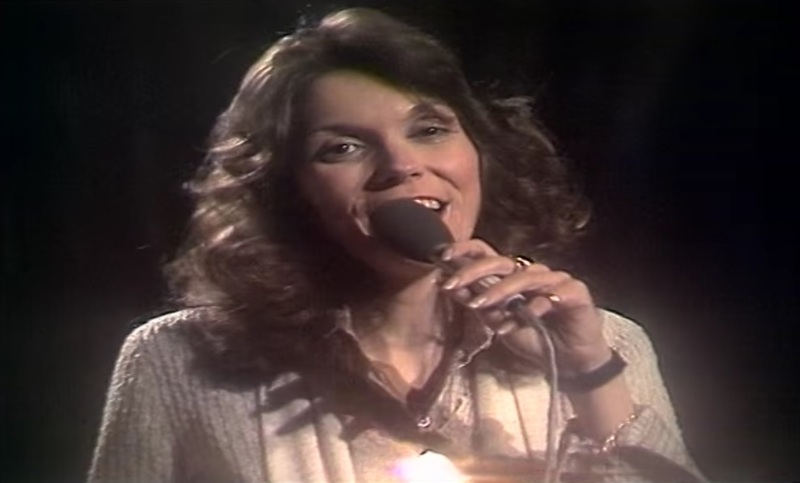 On the TopPop video and The Tonight Show she wore the famous record album charm necklace. I'm sure the camera man loved that bling. I think she got her money's worth from that outfit. Great clip, Rick. Karen is a fool...LOL!! The look on her face after she sang pieces of "Sing". LOL!!! She had charisma for days and it's all there. Cubby absolutely killed it on the drums! Wow. I was not aware that Tony played keys but he was playing the organ during "Superstar". I also find it interesting that the fuzz on Tony's guitar is a bit toned down and more flanged, though he was certainly rockin' it out by the end anyway. Carpe diem and Jamesj75 like this. Goodbye To Love--June 1978 (?) --are incredible. Passage, in this 1978 interview ? The Singles 1969-1973, to camera and audience. Even Merv Griffin, 1981, held their Made In America album up to the cameras. The show hosts often held up the album sleeve for the act that was about to perform to the cameras - presumably so the audience knew what to buy to get the song being performed. For the 1978 Tonight Show performance though, they were promoting their MGM Grand performances and sung a song that wasn't available to buy, so I guess there was no reason to show the Passage album. Presumably the album had fallen off the charts by this point as well, so they'd already moved on from promoting it. Man Smart, Woman Smarter...I had to spin the LP Passage...once again. I must say, I still very much LOVE this album. Calling Occupants of Interplanetary Craft...over-the-top fantastic. LondonRobert, John Adam, Jamesj75 and 1 other person like this. Passage is one of my least played Carpenters albums, but having just read your comment I honestly don’t know why, as I like every song! I’ll be playing it in the car later today! John Adam, Jamesj75 and Rick-An Ordinary Fool like this. I’d have to agree. It’s an album I hardly ever play but I do enjoy seven out of the eight tracks so I think I’ll dig it out and give it a long overdue play as well! AnnaSock, John Adam and Jamesj75 like this. Rick, once again you are there with some great photos...appreciated! goodjeans, John Adam and Rick-An Ordinary Fool like this. If you also notice on the high res photo above of Karen from Space Encounters she’s wearing her famous K ring. The album has some incredible moments: B'wana..., All You Get..., I Just Fall..., Don't Cry For Me Argentina, Two Sides. GaryAlan, AnnaSock, Rick-An Ordinary Fool and 2 others like this. You had Cher making a fashion statement each week on her show dressed in Bob Mackie outfits (never the same thing twice), and then you have Karen, a very beautiful women, wearing stuff that looked like the leftovers from a Downey garage sale. Exactly what I’ve always thought about some of her clothing choices. My mother often says she dressed terrible, especially in the later years. The outfit she wore on the Tonight Show and on Space Encounters is awful. I very much remember when Passage came out. I had just transferred from my summer job working in a dept. store record department, to the new stand alone mom and pop stand alone store in a newer, more hip part of town. My manager was also the music director for the top rated top 40 type station here in Bakersfield. KERN 1410. The weekend guy came in the store to visit and said “we got this weeks new music in” the new Carpenters album is in the box of new releases. I was ecstatic to say the least, and he told the guy to drive me over to the station and get it. I was disappointed that it had a plain white cover, promo stamped on the cover. Anyway we took it back to the store and played it in it’s entirety. Then I took it home. Calling Occupants did well here as a result of my influence on the music director as did Passage. He put it in the top 10 for several weeks on their published playlists we handed out for free to customers. He left that station and was let go from the music store for “bad inventories” etc. and I became the store manager on Christmas Eve 1977. He went on to program the new country station in town, going up against Buck Owens owned KUZZ AM and FM, the highest rated station here, even still today. Anyway my former boss called me at the store and said listen to the new station right now. The next song played was Sweet Sweet Smile. I couldn’t belive it, Carpenters on a country station. How cool was that! He put it in heavy rotation. I think it went to number 2 here. Not sure about Buck’s place. I know they played it. I was so lucky to hear and have a copy before it was for sale in stores. I think I have at least 4 or 5 copies of Passage on vinyl and acetate with weird Occupants opening. I drove the neighboring stores crazy playing that album every day for months. They could hear everything we played through the walls with 4 Altec’s blasting away. Best job I ever had. goodjeans, Jamesj75, GaryAlan and 3 others like this. Easily one of my all-time favorite Carpenters' recordings. Listening to Passage as I work. I must say B'wana ROCKS- and as with Boat to Sail, always puts a smile on my face. Definitely one of my favorites!